Ham and pears are delicious on their own, but together they make a unique fall sandwich. The other night, after working late in the field for harvest, Hubs had his weekly dart league. He sent me a text that he would eat out and that I shouldn’t worry about supper. These are the kind of nights when my own nourishment goes off the rails. Without someone else to cook for, a proper meal just doesn’t seem worth the effort. I think that I reported (aka whined) on one of my social media accounts that I wished for food delivery in our small town. I know that I ate a sliced tomato and gummy bears. This sparked the interest of one of the South Dakota Magazine staffers, Laura. She asked if it was a tomato and gummy bear sandwich. Laura believes that ANYTHING can be made into a sandwich. This may have started with a never-ending supply of Easter ham, but rumor has it that she also once invented a cake sandwich. I have had grilled slices of pound cake layered with strawberries and Nutella and think that a cake sandwich might be just fine, but a tomato and gummy bear sandwich? I am not as adventurous as Laura and will pass. That isn’t to say that I am not interested in bold flavor pairings and unusual ingredients in a sandwich. 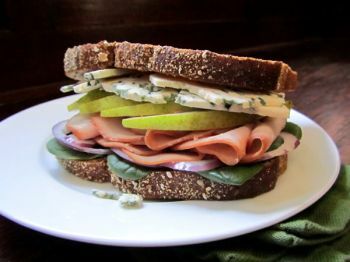 One of my favorite fall combinations to pile on bread are ham and pears with tangy bleu cheese. Tossing a light spinach salad into the mix makes this a much healthier meal than a tomato and gummy bear sandwich. And one that with very little effort is absolutely delicious. Toast bread and spread with butter. Toss spinach with just enough olive oil and vinegar to coat the leaves; season with salt and pepper. On one slice of toasted bread, layer the salad, then slices of red onion. Follow with ham, pear and bleu cheese. Top with remaining slice of bread and enjoy.